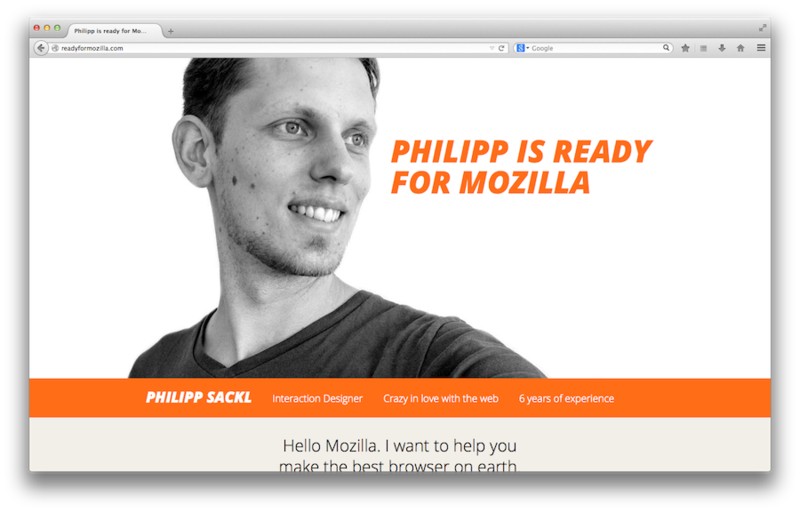 I recently started working as a Senior interaction Designer at Mozilla. Here's how that came about. When we first decided to shut down envis precisely, I didn't intend to look for a job right away. I wanted to take some time off and work on business ideas that have been bouncing around my head for a while. But all that changed when I stumbled upon a job posting from Mozilla. It was instantly clear to me that this was the job I wanted to do next in my life. I only intended to send out this one application. So I had every reason to make it count. I decided to act on that opportunity. And since I had a solid backup plan in place, I could go about it without much pressure. I only intended to send out this one application. So I had every reason to make it count. This is how Ready for Mozilla has been born. TL;DR: Making the case for yourself as a job applicant is a design problem. Applying techniques from user centered design helps. Always be relevant. Quality trumps quantity. After making the decision to apply, it quickly dawned on me that this was nothing more or less than a design problem. I wanted to communicate something to a busy yet potentially interested audience. This means I had to get their attention, communicate efficiently, and then make them act on the opportunity. The good thing about being a user experience designer is that I have been doing this kind of stuff for quite some time now. When you are a designer, there is no excuse not to treat a job application as a design problem. So who was my audience? First it was the recruiter scanning the applications. Then it would likely go through the hands of a hiring manager before being shown to more members of the team. Opting for creating an application website instead of a PDF was logical. It set me apart from some other applicants, it was a relevant choice and it was easy for me to do (I have come to the point where I find designing for print just really, really annoying). It also has been done before by people like Florian who was a major inspiration for me. Clearly state why you want this job, not any job. The first couple of text lines pitch both my dedication and my experience, but perhaps the most important section is »Why Mozilla«. Something like this should be part of every job application. It clearly states why I want this job, not any job. The rest of the page is pretty straightforward. Some musings about why I am a good choice for them, a resumé and links to some relevant projects. Which brings us straight to the next part. I had one inherent disadvantage for this position: The only work I did on desktop UI projects is strictly confidential. Having nothing to show in the most relevant field of my portfolio was of course unacceptable. The fact that I had to do something in this area anyway made it easier to commit to going all in and creating a micro project just for this application. What was there to lose? Even if it didn't work, I'd just have spent a weekend on a portfolio project for a company I really like! Out of this idea came Tab Spaces, a redesign of a current Firefox feature called »Panorama«. The concept consisted of a prototype, a video explaining the concept and a description of the process. What I presented there was by no means complete, but it did the job. It was good in the areas that were relevant for the position. Perfectionism can create inertia, so make sure to find a good balance there. Mozilla responded to me within just five hours. What followed was the usual process of phone interviews, personal meetings and – finally – an offer. What I didn't anticipate: During the entire interview process, the website was a constant topic. We mostly talked about things I wrote there or about the Tab Spaces concept. So by creating a decent initial application, I unwittingly also set the stage for everything that followed. Even now that I started, people are still approaching me with »Aren't you the guy with the website?«. So I can safely say that the time I spent on readyformozilla.com was a great investment. Sending out a hundred job applications is like making a hundred marriage proposals. If the job you are looking at has any intellectual component whatsoever, then being relevant and unique is more important than risk diversification. (spoiler alert: if you are reading this, your job most likely does have an intellectual component). So take your time. Find one or two jobs that you can be excited about. Then blow their minds. By the way: Mozilla is still looking for people!